Finally, have a look at the sheer number of programs that start when your machine does – it’s a safe bet that you don;t need all of these “vampire” apps that run in the background draining your memory. We recommend Windows Startup Inspector as a free, but slightly geeky, app that lets you disable unwanted crud. A few years back, the idea of taking the back off your desktop or laptop to replace the memory scared many, and required some solid knowledge of what you were doing. RAM upgrades were also fairly pricey. One of our recent projects here was upgrading some of our machines – a Compaq desktop, a Dell laptop and an ASUS notebook. It was both cheaper and easier than expected, thanks to a handy tool that’s free from memory sellers Crucial.com. It’s very easy to use, and even if you’re not in the market for a RAM upgrade, it’s worth a quick check to see what sort of figure you’d be looking at to get a system speedup. As for the upgrade itself – very straightforward. The laptop was a case of removing a single screw and replacing two chips – the netbook was also straightforward. The desktop upgrade was OK too, but the angle of attack for the RAM slots as a little tight, as there’s quite a lot packed into a fairly tight space – nonetheless, easyish, and fast. Without this kind of tool, it’s very easy to pick the wrong sort of memory, as there are lots of different memory types and configurations – Crucial’s tool makes it very easy, and it’s well worth a try. We’re pleased to report that since the upgrade, all three machines are buzzing – especially the laptop that we use for in-the-field podcast recording. The RAM from Crucial was also almost half the price that the laptop’s maker Dell was trying to sell us, proving that (here comes the pun), it’s “crucial” to shop around. Any comments on suggestions on speeding your machine up, please let us know in the box below. Happy New Year to our regular site visitors – we hope 2013 is a good one for you! As we do each year, our podcast team has taken a look back at the last twelve months of technology and put together an Audio Guide to 2012. If you’ve not listened to our podcast before, we’d urge you to have a listen, and maybe sign up. Shows are, of course, free. Just a few of our highlights from 2012, and our podcast production team has just launched their audio review of the last year for your listening pleasure. If you’ve not tried our podcast before, that can be your News Year’s Resolution! Our podcasts are free, and you can listen to them online, or if you have an iPod, iPhone or iPad, listen to us via iTunes. There are several ways you can listen, and in each show, we cover a different tech topic. If you’ve not had a listen, please give us a try and see what you think – You can take a listen to our review of 2012, which gives you a great idea of what we’ve been up to over the last year, and also hear us out-and-about at Birmingham’s Gadget Show Live. The mail server “mail.xxxx.com” is not responding. Verify that you have entered the correct account info in Mail settings. Every time that I open the Mail app on my iPhone, I see this message at least half a dozen times. I hit OK, only to see it again, and again. I’ve trawled the Internet looking for answers, and nothing seems to apply to my situation, although loads of people have reported the same problem. In my case, I know why this is happening… It’s because I have multiple POP3 email accounts on my phone, and some are on the same email server. 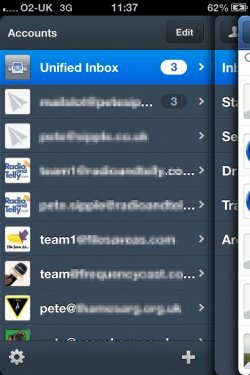 Due to the nature of my work, I have different email accounts for the different clients and websites that I work for, and when my iPhone checks for new mail, it has to scan close to 10 different email accounts to check for new waiting messages. From reading various reports of the problem, it seems that the iPhone Mail app may not be correctly closing off an email connection when it’s finished checking for me messages, meaning that next time it’s checked, the app reports that a connection cannot be made to the email server. If you’ve never seen this error message, you’ve no idea how tedious it is to have to press the “Ok” button to clear this message up to 10 times each time you check for a new message! I’ve tried everything I can think of – changing the settings – disabling accounts, changing the checking frequency, and even changing the security settings on the email server – but nothing worked. Until today. The fix has been for me to abandon the Apple iPhone Mail app, and install a new email application. Surprisingly, there aren’t many out there, and that’s likely to be something to do with Apple, and that they don’t like apps that steer people away from their own native applications. This isn’t a free at, but at £1.99 it was worth a try… and I’m happy to report that since installing this application, there’s been no sign of the dreaded error message when checking for new mail. The app handles multiple email accounts very well, and is one slick app. There are a couple of things that it doesn’t do – and key to many is that it won;t check for emails in the background. 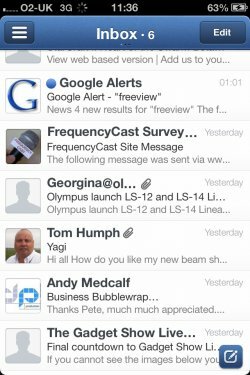 It;’s also not fully integrated into the iOS6 operating system – meaning that it’s not perfect… but for checking, reading and sending emails, it’s great. It also adds a lot of features not found in the standard iPhone Mail app – it plucks people’s photos from your contacts store and also from Facebook, and makes clever use of left and right swipes to manage your mail. Also, for those with multiple accounts, it offers account icons. So far, I’m loving this application, and it’s great to be able to check for email without having due ensure multiple presses of the “Ok” button every time an email comes in. 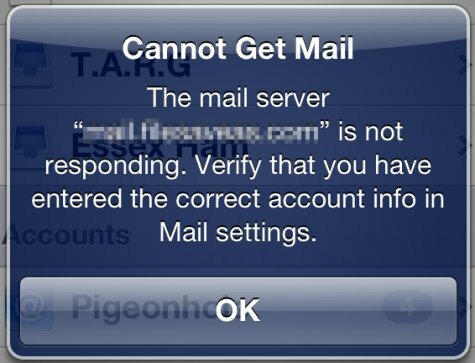 If you’re plagued by the “mail server is not responding” on your iPhone, give the Sparrow app a try. Download Sparrow for iPhone from iTunes. 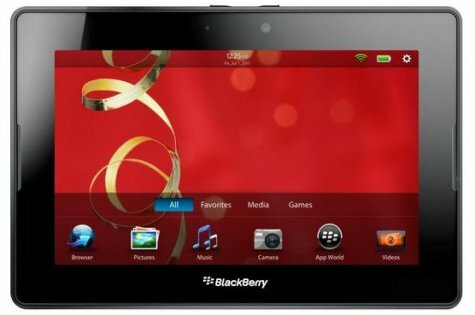 Last month, we reported that Blackberry’s 7 inch tablet device had been slashed in price, down from £399 to just £169. This nifty little tablet is still on offer at that massively reduced price, and has just got even more attractive thanks to a free software upgrade. Support for Android applications with the Android Player. The addition of support for Android apps is huge, and could make all the difference for the Playbook, although it’s important to note that not all Android apps are available. Developers have to make some tweaks to get the apps to run, and the Playbook-ised apps need to be approved by RIM before the can be added to the Blackberry App Store. Expect to see a large amount of new apps on their way now that OS2 is out. Fancy the idea of getting Siri on your mobile phone, but don’t have an iPhone 4S? Well, move over Siri, as Evi is here, and she runs on a much wider range of smartphones and tablets. Evi, created by developers True Knowledge, is a credible rival to the voice recognition service for iOS, known as Siri. Evi, with her cyclops single-eye icon, makes good use of the microphone on many smartphones to listen to commands, send them over-the-air for processing, and returning text. We’ve been testing Evi here on a Samsung Galaxy Tab tablet computer as well as on an HTC Desire smartphone, and although a little slow, it’s still pretty usable, and returns some sensible answers. You can also say a few silly phrases to Evi, for some largely amusing answers. Whilst we’re not saying that this rivals Siri for speed or slickness, it’s an app worth trying, and it has the advantage of being a freebie. Also, don’t expect the smooth integration with Android that you get with Siri. You won’t be able to get Evi to send a text message, or add an entry to your diary – It’s limited to performing online searches – although in a rather stylish way, without Siri’s “here’s a webpage” cop-out. Yes! Evi is also available for Apple devices, and currently has the advantage for those of us in the UK in that it: a) supports UK business lookup (e.g. 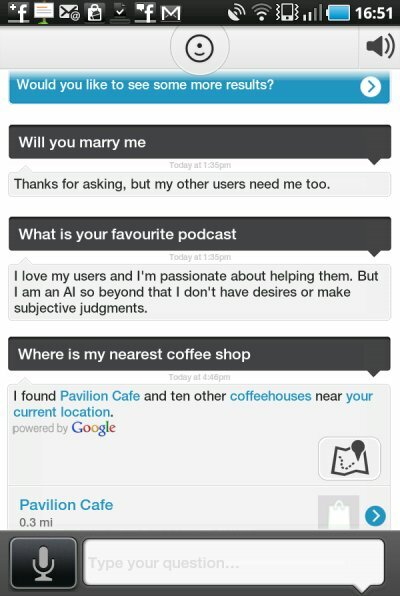 “Find my nearest coffee shop”), and b) has a female voice, rather than the male voice us in Britain get by default. We’ll continue playing with what appears to be the best rival to Siri, and report back if we uncover anything interesting. Broadband in the UK is about to get a little bit faster, as Virgin is planning to double the speed for many of its customers in the next 18 months. Virgin Media, operator of the UK’s cable TV and Internet network is planning to double the download speed offered to customers of its 10Mb, 20Mb, 30Mb and 50Mb services from next month. The speed upgrade will start from February 2012 for some customers, and be complete across their cable network by the middle of 2013. Although the upgrades are set to cost Virgin £110m,customers will get the speed increase for free. A free doubling of broadband speeds is a good thing, and it will take the UK’s fastest download speeds to 120Mbps, which is three times better than the maximum speed offered by other UK broadband providers such as BT and Plusnet. Last year, BT announced its plans to roll out its BT Infinity fibre service to 66% of the UK by 2015, at a rather more pricey £2.4 billion, but currently, BT’s fibre service only offers 40Mbps. Virgin has been in a great position to offer a fast connection as they only offer the service in the more profitable parts of the UK, and their network was built as a fibre network from the ground-up, and isn’t an old network of copper cables and telegraph poles that requires a major upgrade just to get speeds of up to 40Meg. Virgin’s also pretty accurate in its speed prediction – if you pay for a 30Mbps service, you get close to that figure, whereas here at FileSaveAs, the machine we’re using is on an “up to 20Mbps” connection, and we’re seeing a speed of about 4Mbps. Sadly, neither BT Infinity or the Virgin cable network is available where we live (yet), and each time we check on the date for fibre in our area, it seems to be pushed back by 3 months. If fast broadband is of interest to you, the winner in the UK is clearly Virgin, and customers are also set to be winners too, as they’re about to start getting free upgrades to even faster speeds. Got Virgin? We’d love to know what you’d like to use your new shiny faster connections for – Please add a comment below. Just a few of our highlights from 2011, and our podcast boys have just launched their audio review of the last year. Our podcasts are free, and you can listen to them online, or if you have an iPod, iPhone or iPad, listen to us via iTunes. There are several ways you can listen, and in each show, we cover a different tech topic. If you’ve not had a listen, please give us a try and see what you think – You can take a listen to our review of 2011, which gives you a great idea of what we’ve been up to over the last year, and also hear us out-and-about at Birmingham’s Gadget Show Live.